“I AM Brave!” is the fourth book in the Journey of Joy series. The series delves into issues of self-esteem, integrity and authentic happiness in a fun and experiential way. Through the eyes of a seven year old girl named Joy, we meet new and unexpected friends along her path to choosing a more joyful life. 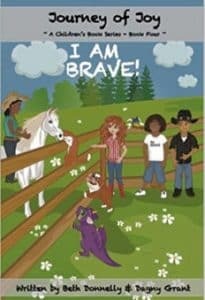 “I AM Brave!” continues the story of Joy’s journey of discovery with her friends Fred the baby dragon, Glitter the wise butterfly, Stanley the bulldog and Johnny the new kid at school as they journey to the Happy Creek Horse Rescue ranch. Have fun with these friends as four new characters enter the journey. They share stories of bravery and learn how to be comfortable with who they truly are. If your kids like this book, they will LOVE the other three in the Matrix Productions Journey of Joy series: “I AM Enough!”, “I AM Unique & Awesome!” and “I AM Great!”.